Nestled at the heart of the Burgundy region lies the ancient city of Dijon, capital of Côte-d’Or. Settled in the neolithic period, to the Romans it was known as Divio (sacred fountain); today it is a city of 150,000 and known internationally for the distinctive style of mustard which originated there. From the 11th century onward, Dijon has been a center of tremendous wealth, power, art, learning, and science. 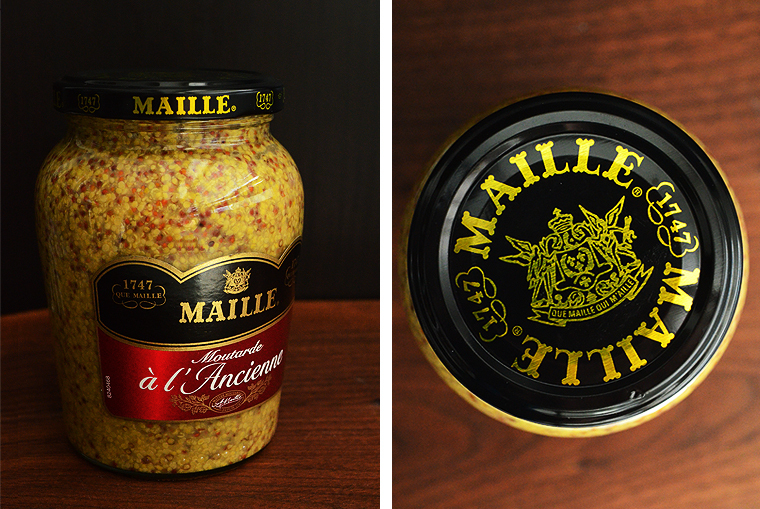 But to most people, the name Dijon is synonymous with mustard, and Maille is one of the leading producers of Dijon mustard today. In 1720 Antoine-Claude Maille, a distiller and vinegar maker who lived in Paris discovered the antibacterial properties of vinegar and created the “Vinegar of the Four Thieves”, an early antiseptic which saved the people of Marseille from the ravages of the plague. He advised them to mix a teaspoon into a glass of water as a drink and to rub the vinegar on the temples and palms which drastically reduced transmission of the disease. It was in 1742 his son is certified as a master vinegar maker, which instantly put him in a position to sell his mustards to a broader audience, opening his first boutique on Rue Saint-André des Arts in Paris, and shortly thereafter he became the official supplier to the court of Louis XV; it is then that La Maison Maille was established. 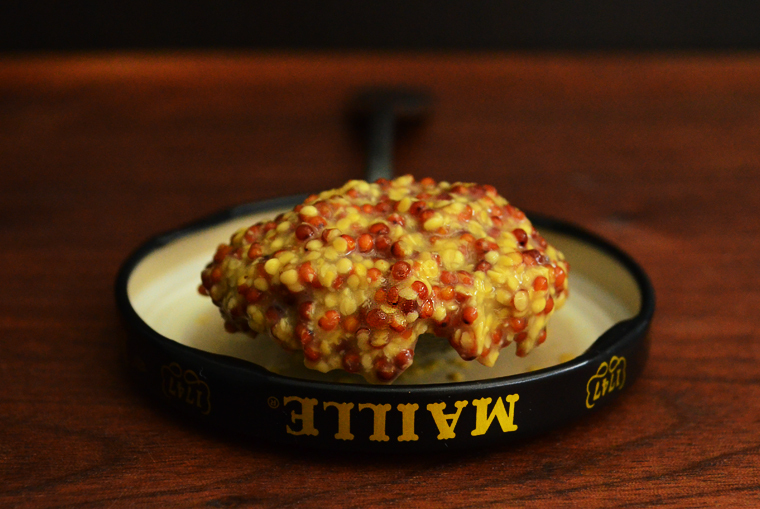 Today mustard is most often used merely as a condiment, however, it is often used in the kitchen as an ingredient in mayonnaise, vinaigrette dressings, marinades, and even barbecue sauces. 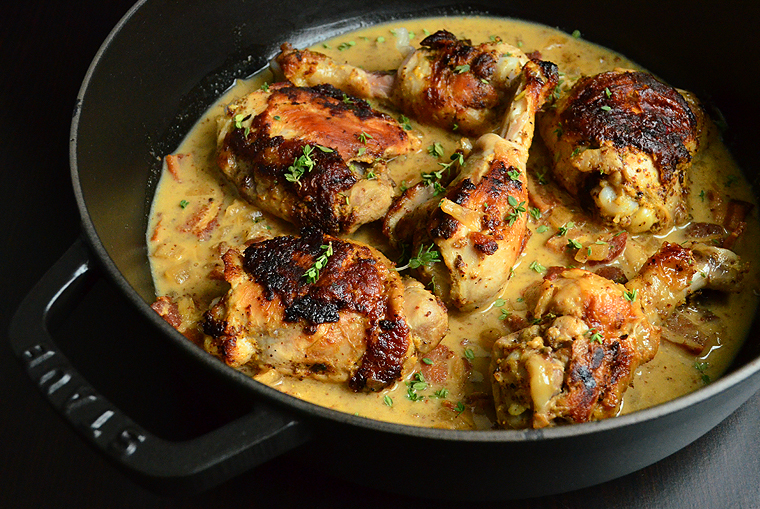 One of my favorite ways to cook with mustard is in a French country classic poulet à la crème et moutarde à l’ancienne (chicken with whole grain mustard sauce). 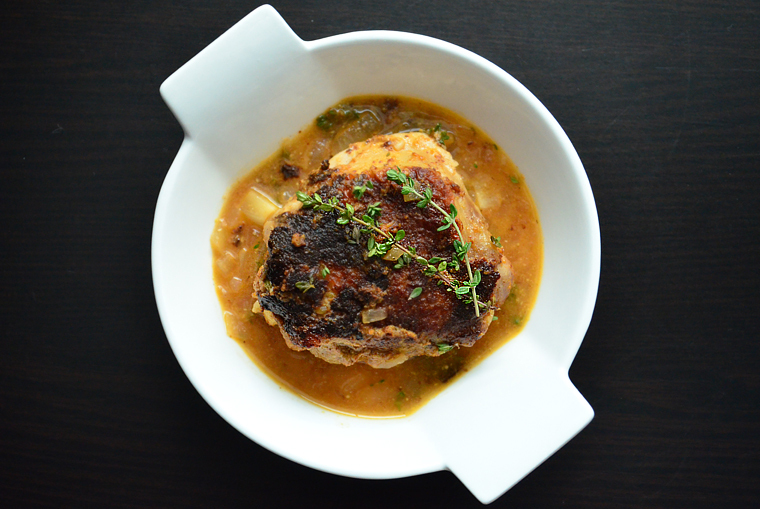 This dish can be found all over France served in bistros, and there are endless variations to tailor it to local tastes. 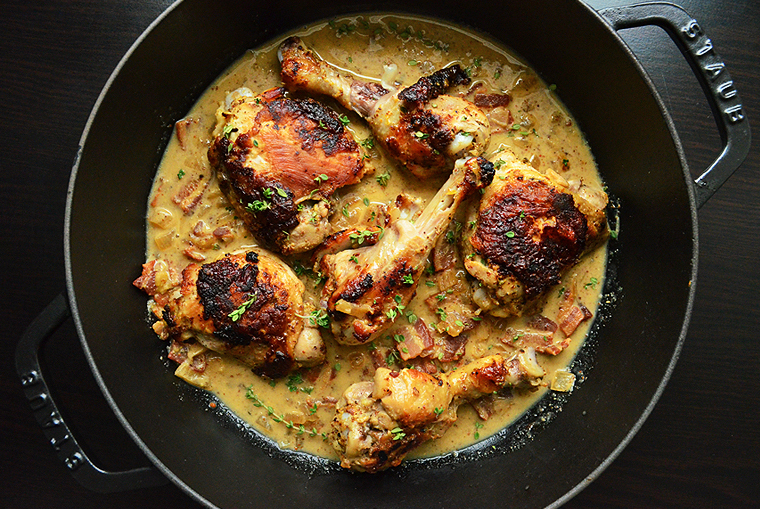 The authentic recipe calls for heavy cream but I find using a couple tablespoons of crème fraîche adds a velvety richness which wonderfully compliments the golden, crispy skin of the chicken. 2 tsp of fresh thyme leaves and a few whole springs for the pot. 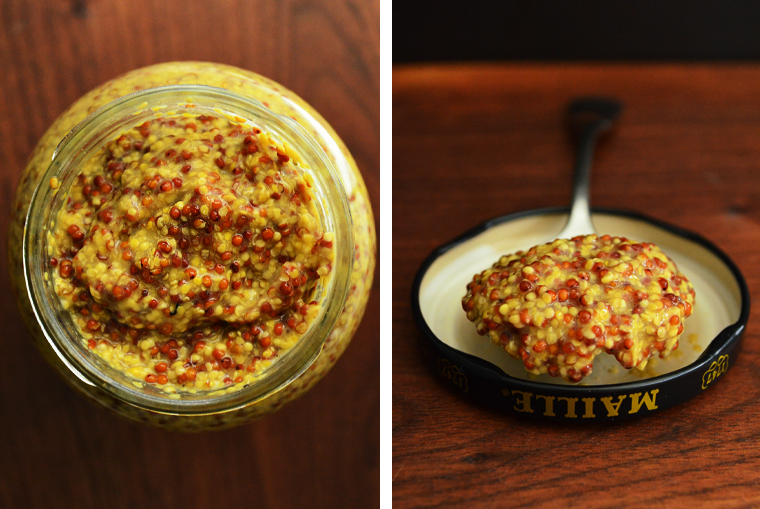 Mix the 3/4 cup mustard, paprika, cracked pepper, and sea salt together in a small bowl and set aside. With a paper towel, dry the chicken and lift the skin, sliding a finger underneath to separate it from the meat. With your hands, spread some mustard mixture under the skin and coat the outsides then set aside. 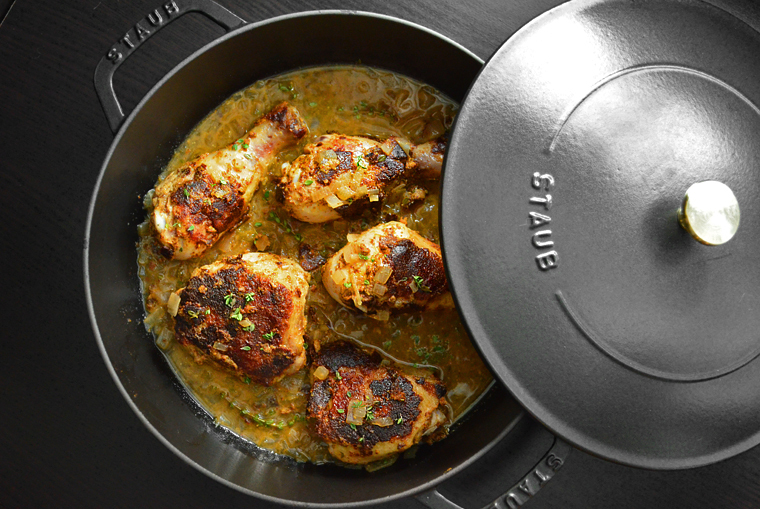 Heat a large, heavy skillet, or a cast iron Dutch oven (Staub is my brand of choice) over medium heat and add the sliced lardons and cook until just starting to brown, stirring frequently. 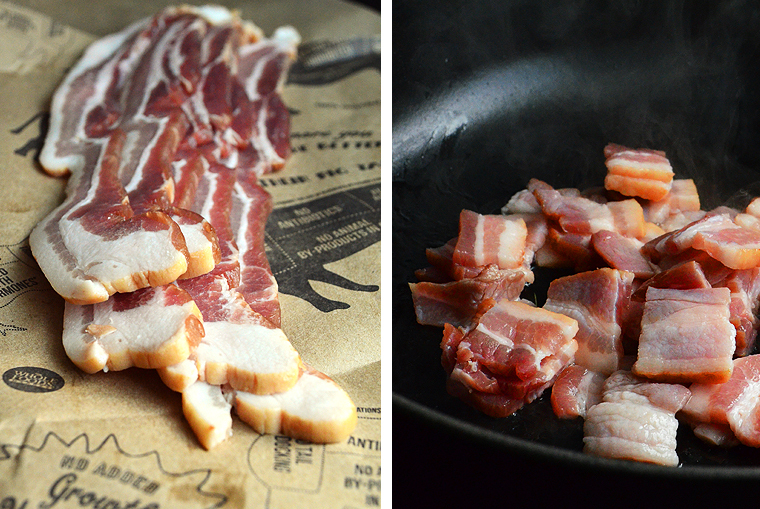 Remove the lardons from the pan and drain on a paper towel. Drain most of the fat out of the pot leaving just a coating on the bottom, then add the chopped onions and cook until soft and translucent. Move the cooked onions to a bowl and set aside. Add 1 tablespoon butter to the pot and place the chicken skin side down in a single layer. You may need to work in batches to avoid crowding. Cook the chicken on medium heat until the skin is golden, then flip and brown the other side. Once the chicken is cooked and the juices have gone from red to clear, remove from pan and set aside. Deglaze the pan with white wine for about three minutes, scraping the darkened bits of fond from the bottom. Add the fresh thyme, bacon, and onions back to the pot and cook for two minutes. Add the whole grain dijon mustard, crème fraîche and stir. Add the chicken to the pot and turn to coat, then cover. 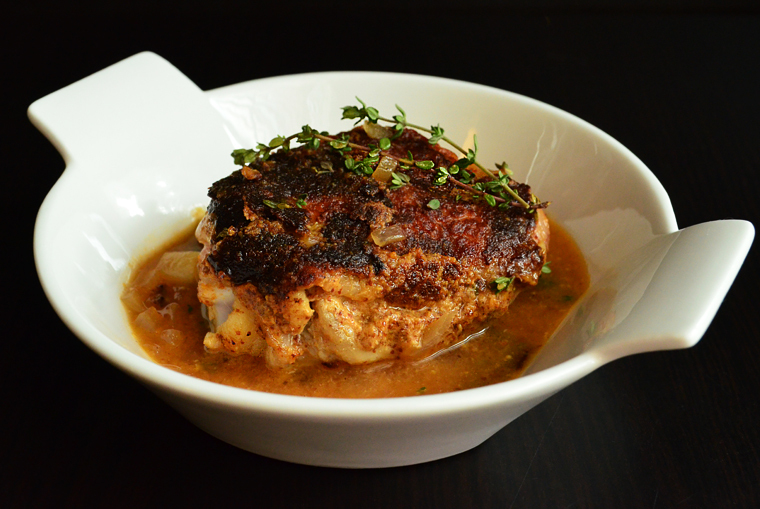 Cook the chicken in the sauce for about 10 minutes on low to medium heat. Plate directly from pot and garnish with fresh thyme sprigs before serving immediately. 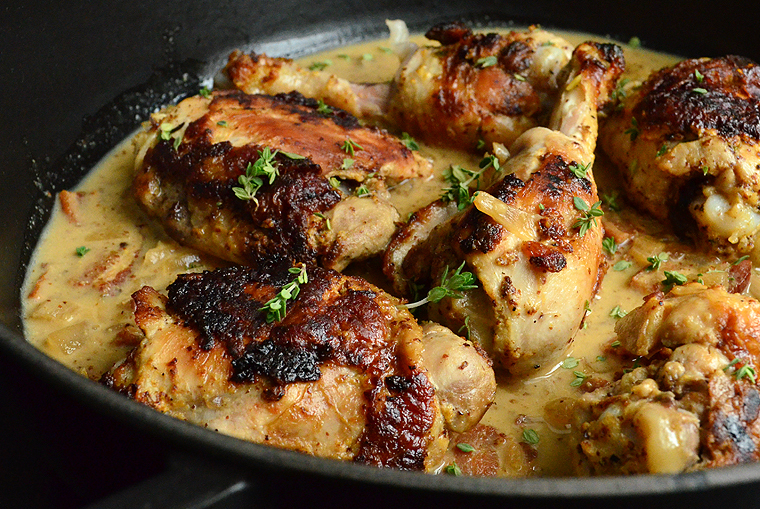 This entry was posted in Chicken in Maille Mustard Cream Sauce recipe and tagged Chicken in Maille Mustard Cream Sauce recipe, Easy Dinner Recipe, Easy French Dinner recipe, Easy French recipe, Easy Lunch Recipe, france, french, French dinner recipe, French Poulet à la crème de Moutarde, french recipes, Maille Moutarde recette, Maille Moutarde recipe, Maille Mustard, Mustard recipe, Poulet à la crème de Moutarde recette, Poulet à la crème de Moutarde recipe, Staub Braiser Pot, Staub Products. Bookmark the permalink.